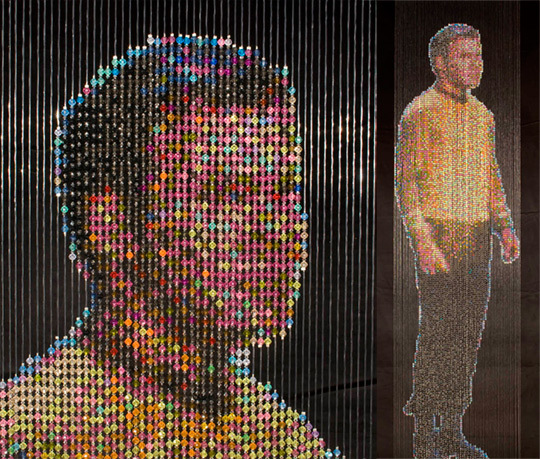 Review of "Devorah Sperber: Mirror Universe "
For some of the pieces, Sperber used spools of thread to create photomosaics of Trek characters. A 47 x 37.5 x 60-inch portrait of Spock took 1,200 spools to make; a stainless steel ball is required to see the piece right side up. Sperber also threaded together TNG's Holodeck (using 9,600 spools) and the Enterprise bridge (5,822 spools). To re-create the look of being beamed up, Sperber used semi-translucent beads to thread the standing characters into shape. The image of Captain Kirk (pictured) uses 25,000 plastic beads strung onto monofilament.